Penn’s Theater is performing their production of “Kiss Me Kate” this weekend, March 3rd and 4th at 7 pm and March 5th at 3 pm. 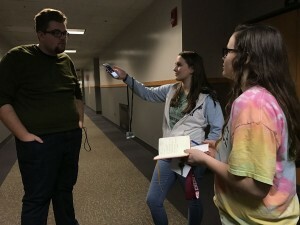 The lead actors, Bryce Yoder and Anna Vukmirovich, both class of 2017, give PNN reporters a behind-the-scenes look at their work. ‘Kiss Me Kate’ has required hard work and dedication, just like any play. Mrs. Black advises, “It’s always great to swallow your fear, and audition.” Tickets are available to purchase at lunch or order online here. Support Penn Theater at one of the three performances this weekend!